Centre declared a stretch from Gaumukh to Uttarkashi eco-sensitive. Why is Uttarakhand dragging its feet over implementing it? Only a month ago, Vipin, a mule herder who ferried tourists and pilgrims from Gangotri to Gaumukh, was worried that a new “government rule” would rob him and his brethren of livelihood. “The rule will kick the poor out of their homes,” the 29-year-old had said about the eco-sensitive zone (ESZ) notification. After floods ravaged Uttarakhand, Vipin is campaigning for the notification. “I and my family were saved because there is no hydropower project this side. My cousin in Raithal suffered huge losses,” he says. Loharinag Pala hydropower project was operational in this village till some time ago. On December 18, 2012, the Centre declared 4,179.59 sq km, covering 100-km stretch of the Bhagirathi from Gaumukh to Uttarkashi, ESZ under the Environment Protection Act, 1986. This restricts construction of more than 2-MW hydropower projects, extraction of surface water for industrial purposes, stone quarrying and mining of minerals in the area. It also imposes a blanket ban on felling of trees, commercial use of firewood, setting up of polluting industries and discharge of untreated sewage and industrial effluent into the river. Soon after the notification was published, a string of protests followed. A group of people from Bhatwari village in Uttarkashi rallied down the sub-division headquarters beating drums and shouting slogans. Chief minister Vijay Bahuguna vehemently opposed it saying the notification would bring all developmental activities in the state to a grinding halt. When his letter to the environment ministry heeded no result, a delegation of Congress leaders led by Bahuguna met Prime Minister Manmohan Singh on May 6, 2013 and gave him a letter demanding withdrawal of the notification. “Projects with a capacity of 1,743 MW, which are in various stages of development, cannot be executed any more, apart from the already incurred expenditure of Rs 1,061 crore going waste. Such a sensitive decision has been taken without consultations at the field level,” the letter states. The prime minister assured Bahuguna that an inter-ministerial committee would look into his complaint. On June 7, this year, a group of people held a demonstration at the Uttarkashi collectorate under the banner of Uttarkashi Bachao Sangathan. “The notification will deprive us of electricity and jobs. It is being thrust upon us to keep us and the area backward,” said Surat Ram Nautiyal, member of the Sangathan. “Uttarakhand is an important state. It shares borders with China and Nepal. If the government cannot give us development, we will be forced to seek China’s help,” he threatened. Since June 16, when Uttarakhand crumbled under devastation, reactions to the notification have changed. People are now bitter about hydropower projects. They see the projects as “tiny time bombs” waiting to explode. “We read in newspapers that the devastating floods occurred because of too many dams in the state. We were earlier told that if ESZ is notified, we will not have jobs or electricity. Now we see that if it is not notified, we may not have our lives and land left,” says Anand Singh, shopowner in Uttarkashi town. “These mountains are like pressure cookers. The day the mountains explode, they will take us all down with it,” 75-year-old Sunita Rawat had prophesied before the floods. 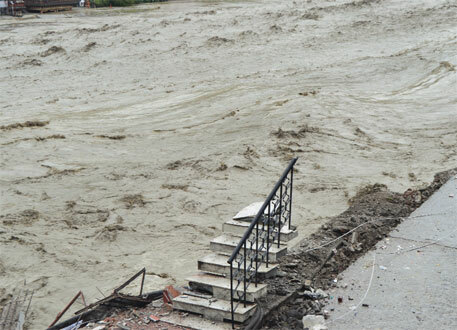 Resident of Bhatwari, 35 km from Uttarkashi town, Rawat is missing after the floods that claimed over 5,000 lives. Rawat was victim to at least five massive landslides in the recent years, forcing her to shuttle from one house to another. In 2010, landslides razed her son’s shop. In December 2005 landslide, she lost a cousin. In August 2005, she lost three goats. Rawat’s husband died in 1991 when an earthquake of 6.8 magnitude hit Uttarkashi. Bhatwari was not the worst affected place in the earthquake. At least 2,000 people of Jhamak village died in it. The tunnel of Maneri Bhali-I hydropower project ran under the village. 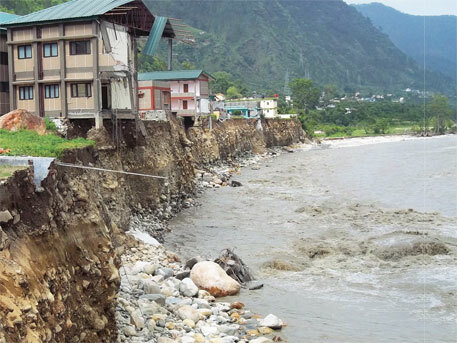 In 2007, many houses sunk in Chai Gaon village because of blastings for the construction of Vishnuprayag hydroelectric project. When Maneri Bhali-II hydropower project became operational in 2008, Dhanari Patti village suffered recurring landslides. In 2010, heavy rains submerged Koteshwar hydropower project’s powerhouse in Tehri. Massive landslides occurred in the nearby areas after water was released from the dam. The same year, Kujjan village, near Loharinag Pala hydropower project, was devastated by landslides. Rawat’s grandson Harish Rawat, a BSc student, blames the project for the landslides. At present, 45 hydropower projects with a total capacity of 3,164 MW are operational in Uttarakhand, the website of Uttarakhand Jal Vidyut Nigam Ltd states. Another 199 big and small projects are proposed or are under way. In the Alaknanda-Bhagirathi basin alone, 69 hydropower projects with a total capacity of 9,000 MW are under way, states a report prepared in April 2013 by the environment ministry’s Inter-Ministerial Group formed to consider environmental flows and hydropower projects on the Ganga and its tributaries. Implementation of the projects would affect 81 per cent of the Bhagirathi and 65 per cent of the Alaknanda. “Who gets power from these projects anyways? We have a power project in our backyard, but we get not more than six hours of electricity in a day,” says Gajendra Semwal, schoolteacher at Gangnani, which is 47 km from Uttarkashi town. The notification is a landmark decision, says scientist G D Agarwal. His fast-unto-death protests had forced the government to declare the ESZ. In June 2008, Agarwal went on an indefinite fast against the implementation of “many environmentally disastrous” hydropower projects on the Ganga from Gangotri to Uttarkashi. The state government reviewed the projects and stopped work at Pala Maneri and Bhairon Ghati I and II. On January 13, 2009, Agarwal again went on fast-unto-death and broke it about a month later after procuring a written assurance from the government that experts will review the 600-MW Loharinag Pala project. He sat on a third fast-unto-death on July 20, 2010. A month later, Union group of ministers scrapped the project. The notification was much needed, says Alok Bhandari, who works at a hotel in Rudraprayag. “Besides the Bhagirathi, the government should have also declared the Alaknanda and Mandakini basins ESZ,” he says. If that happens, where would the urban centres and industries in Garhwal go? asks Agarwal. “It is impractical to turn the entire Garhwal valley into ESZ. We are not against development. We are for sustainable development,” he says. When the environment ministry placed its draft notification in public domain in July 2011, it proposed that 135 km stretch from Gaumukh to Uttarkashi and 100 metres from the riverbanks be declared ESZ. “This was too less, so we gave it in writing. The government did not pay heed to it. Now, the entire catchment area is under ESZ and many villages are under ESZ. Will the government plug the drains in local people’s houses?” he asks. The ESZ notification gives strict guidelines for construction of roads and for muck disposal. Less dynamite should be used in such ecologically fragile areas. If roads are widened without proper scientific plans, ecology is bound to unsettle, says R B S Rawat, principal chief conservator of forests. The ESZ notification gives the state government power to prepare a zonal masterplan in consultation with local people, particularly women, within a period of two years from the date of publication of the notification. The masterplan would provide for restoration of denuded areas, conservation of waterbodies, management of catchment areas and watershed management. It would lay down specific guidelines for the construction of various buildings, hotels and resorts and regulate development in ESZ so as to “meet the requirement of local people without affecting the rights and privileges of bonafide residents”. But before the masterplan is prepared, all new constructions and other developmental activities will be referred to the monitoring committee of the environment ministry. It is not clear if environment ministry’s permission will have to be sought to rebuild houses lost in landslides, to build a new house, or even to add a room to the exiting structure, says Mallika Bhanot of non-profit Ganga Ahvaan. The notification prohibits change of land use areas for horticulture, agriculture, tea gardens and parks to construct new houses. Rights for cremation are also unclear. “The notification has technical mistakes,” says Manoj Chandran, additional secretary (forest), Uttarakhand. The Bhagirathi flows from east to west, not from north to south. Stakeholders were also not consulted before the notification was issued, he says. Micro and mini hydel power projects have been allowed, but where should they be located and on which stretch, is unclear, says Bhanot. It is also not clear whether local people can own small hydel projects. “True, there are grey areas in the notification. But there is a lot of false propaganda against it as well. People are being instigated against it, she says. “A group of people belonging to a political party came to us with banners and leaflets asking us to vacate the village because the area has been notified,” says Pushkar Rawat, resident of Gangnani.